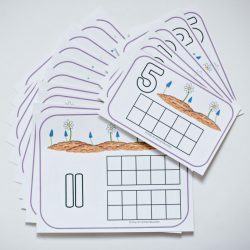 Ten frames are the ideal way to teach beginning number sense skills to preschoolers. 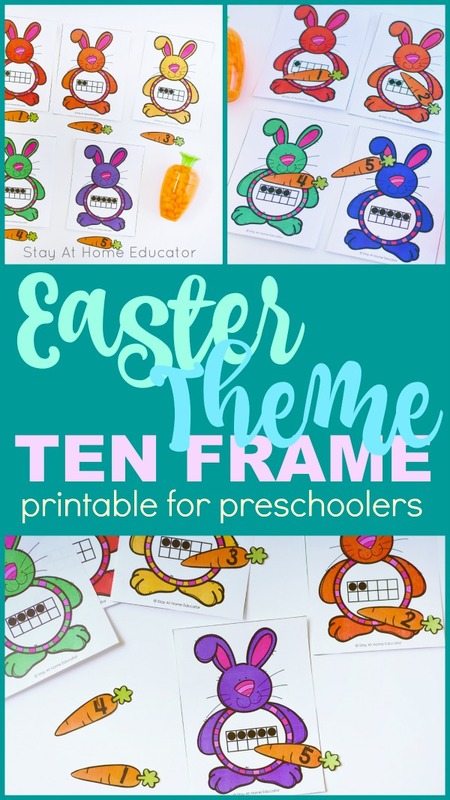 This printable ten frame activity can be added to your preschool Easter activities. In preschool, we spend a lot of time teaching and reinforcing number sense skills. 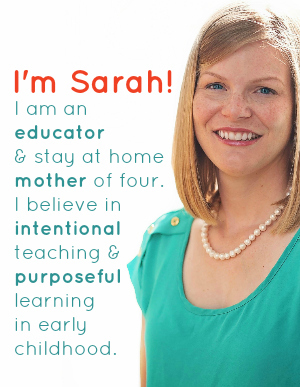 These early math skills come naturally to preschoolers, which one reason why they are developmentally appropriate. There are a lot of benefits to ten frame math. Here are just some benefits for preschoolers. Those skills are the foundation in a base ten math system. I love teaching math to my preschoolers using ten frames because they are such an easy way to organize groups of ten, and in preschool, my goal is for my preschoolers to master number identification and counting to ten. Simple ten frame printables make it easy for preschoolers to manipulate sets of ten and practice organizing ten in different ways. So with Easter on its way, I made these ten frame Easter bunnies to add to our counting practice. And we’ve spent a lot of time counting with them! 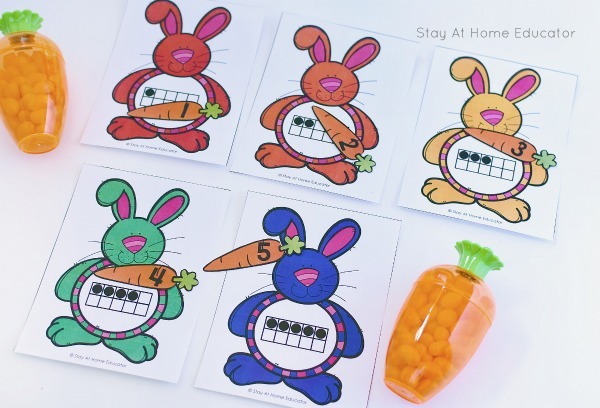 Because what’s more fun than “feeding” a bunny a carrot when you match a ten frame with the corresponding numeral?! Seriously, my preschoolers giggled and laughed out loud as they made crunching noises while feeding their Easter bunnies. And I got lots of smiles in, too, because I knew my preschoolers were having fun getting in ten frame counting practice. Remember, this is a free printable so be sure to grab it from the end of this post. This Easter printable is low prep and designed to be used in your preschool centers, in small group work, circle time, or even independent practice. First, print the printable set, found below. 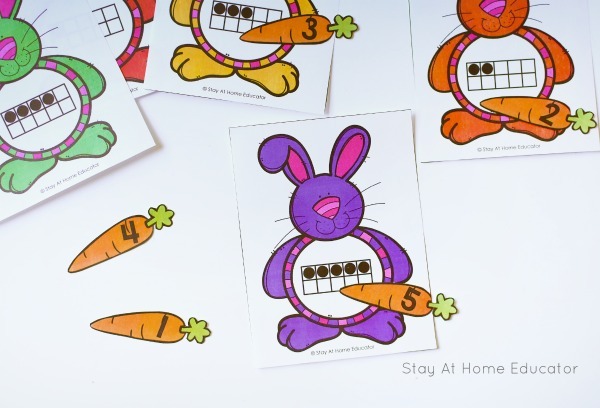 Cut out the Easter bunny in the ten frame printable as well as the numbered carrots. You don’t have to cut out each individual carrot. You can leave them in their little boxes, but I do think they look cuter and nicer if you do. I do like to laminate activities, to preserve the life of them. If you don’t wish to laminate the whole packet, dry erase pockets are a great option as well. 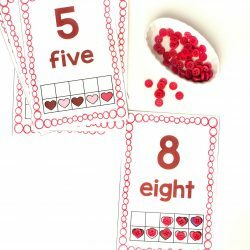 Set out the printable on a tray in your preschool math center or on the table and invite your preschooler to join you in some ten frame counting practice. What’s more fun than feeding a bunny! Seriously, have you ever fed a rabbit. They are too cute! I knew my little boys would eat up this activity (yes, pun intended…I’m so clever) because we had just visited our cousin’s house where they had adopted two teeny tiny bunnies. Their little mouths nibble at a million miles per minute as they crunch through a carrot or lettuce leaf. We took this same approach when I introduced my little boys to this Easter activity. My little boys even starting saying, “munch, munch, munch,” as they fed each bunny. The activity itself is simple. Draw an Easter bunny card. Count the number of circles in the ten frame and find the corresponding numbered carrots to feed the bunny. 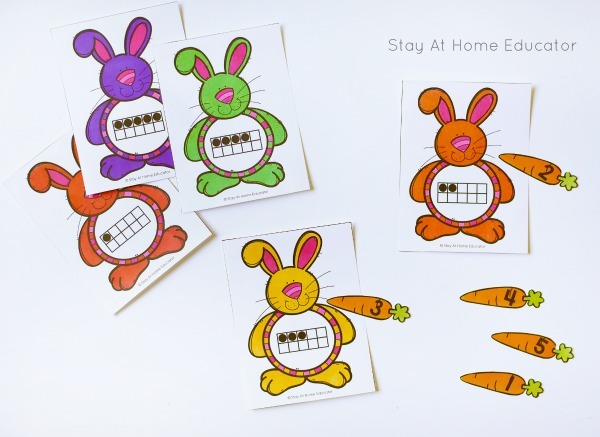 These cards fit four bunnies to a page so not only do they save on printing but they also are just the right size to keep in a small zip-top baggie and send home with your preschoolers, or pack into your purse on an outing, or store in a pencil box until next year. But the smaller size is just the right size for little hands. When using printable ten frame activities with your preschoolers, there are a couple of things to teach your preschoolers about ten frames. Circles “don’t like” to share boxes in the ten frame. When using printable ten frames, only one math manipulative per box, please! Sets of numbers in a ten frame can appear anywhere in the ten frame and will still equal the same number. For example, the number three is the same no matter the configuration in the ten frame. 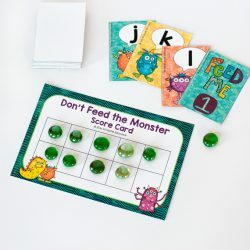 This printable offers traditional ten frame configurations, however when your preschooler is adding her own manipulatives to ten frame she may try a few different ways to organize her counters, and that is perfectly ok! This printable featured numbers 1-10, but here are some other ways to use this single printable. Have your preschooler use items in the classroom to count out the quantity on the bunny and the carrot. Invite your preschooler to make color matches. Sequence the bunnies from greatest to least or the other way around. Use the cards and carrots to play a memory game. 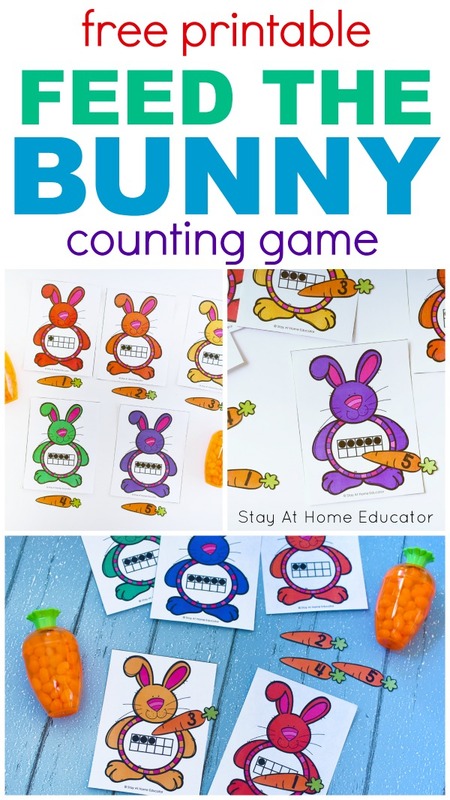 Get in even more counting practice by having your preschooler use a blank ten frame to make matching quantities before finding the carrots. Invite your preschooler to make other numbered “foods” for the rabbits to eat. Looking for More Printable Ten Frame Activities? Check out these printable ten frame activities by clicking the images below. 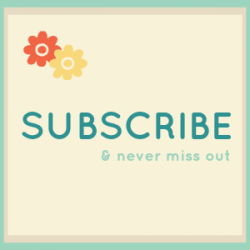 Then grab your FREE Feed the Bunny Ten Frame Printable! 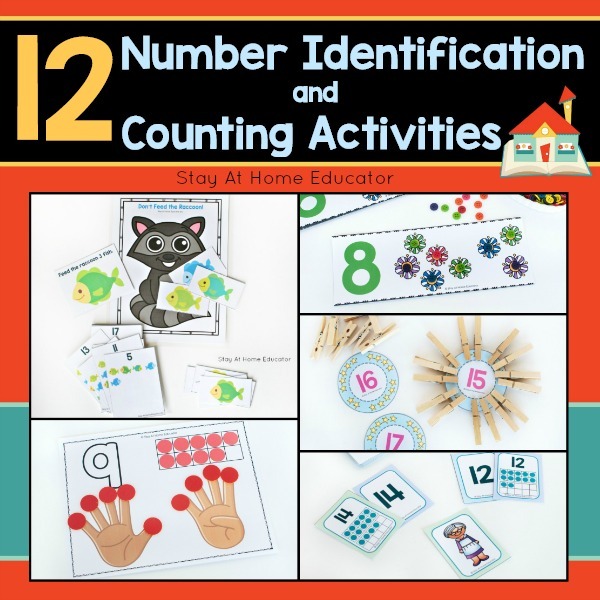 Looking for some Counting Lesson Plans? 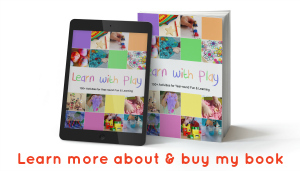 These counting lesson plans for preschool are done and ready for teaching! 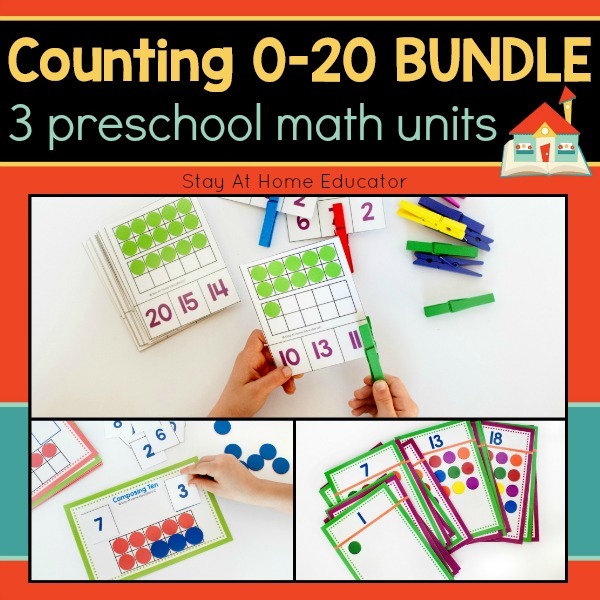 Just print the centers and laminate and you’re ready for an entire 12 weeks of strictly counting instruction and practice for your preschoolers. Then grab your free ten frame printable below! 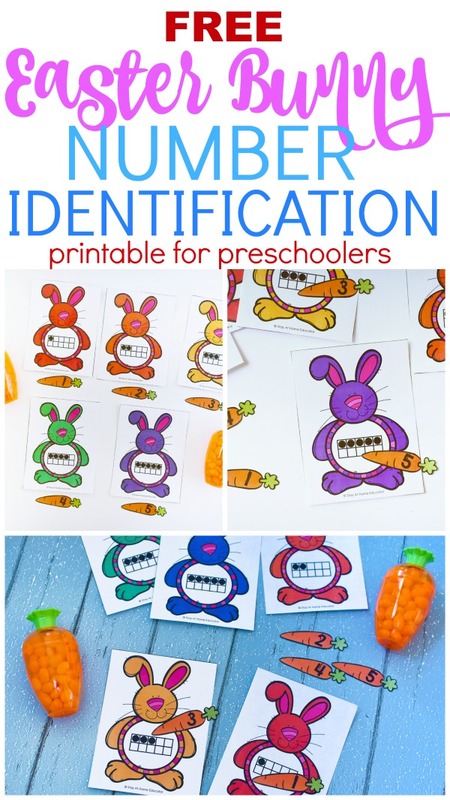 If your preschoolers are really struggling with number identification, this activity pack will save your bacon! Grab Your FREE Feed the Bunny Ten Frame Printable Here! This printable has so many uses. Go ahead and grab it by clicking the image below!